When putting together my list of 40 special activities for Steve during his year of being 40, there were a few that are so Steve that it seemed impossible that he'd never done them before. The #1 example? Visiting the Computer History Museum in Mountain View, CA. 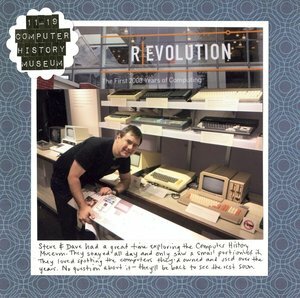 While Trevor and I went with Steve for most of the 40-4-Steve project, we knew he'd enjoy his time at the Computer History Museum with another computer fanatic who would want to carefully study each exhibit (instead of dealing with us being done after an hour of browsing). We bought tickets for Steve and his dad. Sure enough, they were there for the entire eight hours it was open and only saw half the museum. For the layout, I actually used two photos, trimmed to fit together. By adhering them without any space between them, they read as one square picture rather than two rectangles. How awesome for him to visit there!!!! That's how I felt about the Grammy museum! LOL!! Brian LOVED it, but I was bored after an hour! LOL!!!! I loveeeeeeeeee this lo!!!!!! OMG I didn't even notice they were 2 different photos, you paired them perfectly! Also yes, I would have been bored also, LOL!